Previously, in BS 6651, the protection of electrical and electronic equipment was included merely as an annex (Annex C) only as a strong recommendation/guidance measure. Newly released BS EN 62305 will replace BS 6651 and this new standard considers the protection of electrical and electronic equipment as integrally as the protection of the physical structure itself. Protector to be installed in the main distribution panel with connecting leads of minimal length. 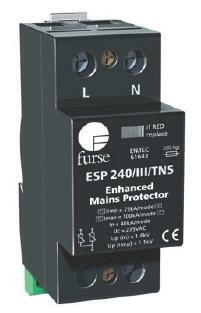 The protector should be fused and is suitable for attachment to a 35mm top hat DIN rail. For pricing or further information, please fill out the ENQUIRY FORM or contact us using the details below.